I can’t believe I am writing this, but it’s a question I get asked a lot. 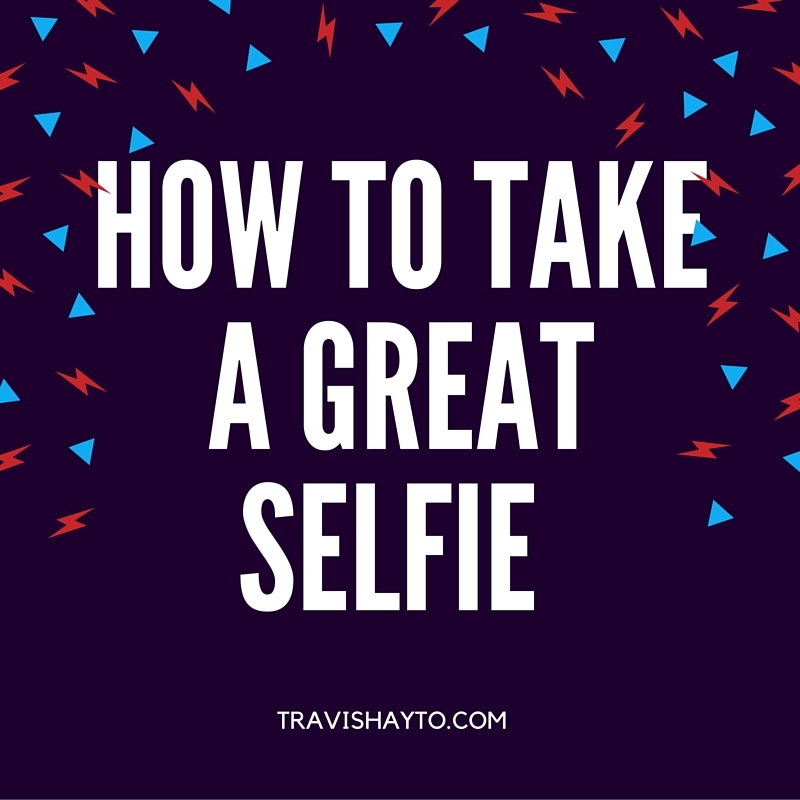 With social media an important part of almost every person’s life, you may as well look good, right? 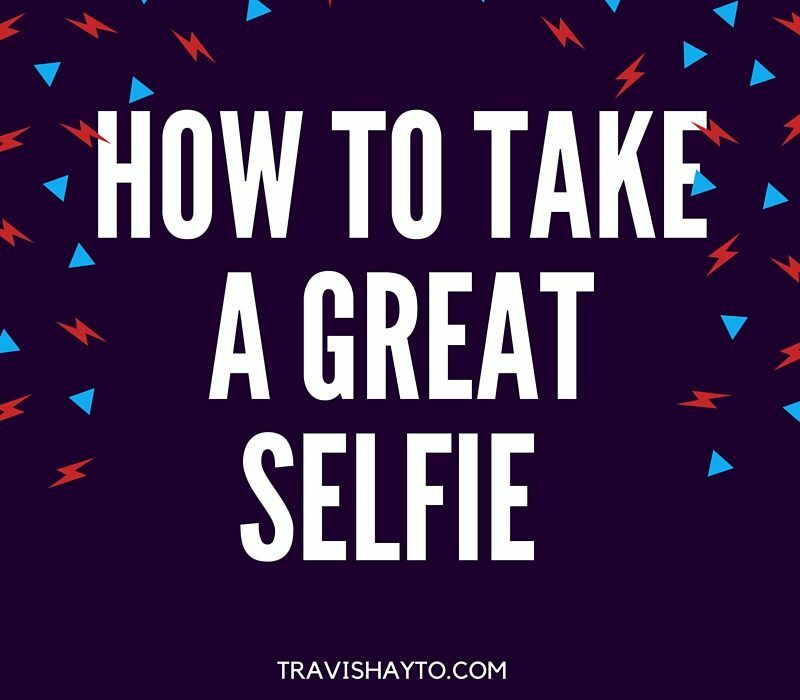 When taking selfies or just posing in photos with your friends, you want to look your best, so follow a few simple guidelines to get the best results. Light is the single most important thing in photography, if there is no light, there is no photography. Move around to find the best light; you being in shade with your background being in shade (very important) will give you the most even light and will be the most flattering. If you are stuck in the sunshine, I would recommend putting the sun at either 10 or 2 over your shoulder. This will mean you and your pals are not squinting as badly as you would if you were looking directly into the sun. Also, no nasty shadows are running down your face over, accentuating that nose of yours. Move to find the best light, as this will make the biggest difference! Your body looks better at certain angles. Gentlemen, if you want to look buff, big and strong, then point straight onto the camera and stand up nice and tall. This will make your shoulders look broad. Ladies, stand at about 45 degrees to the camera, as this will make you look slimmer, but don’t turn completely side on, as then this angle will show those parts you don’t want to like a flabby belly or the thighs you wish to keep hidden. UNDER NO CIRCUMSTANCES do you ever turn side on and dip your shoulder towards the camera while bending your knee and having your arm on your hip. This is all too common with teenage girls, and you will risk looking like you’re at a bad underage party. Just don’t do it. The only thing more awkward than doing the above is when you have that one person trying to hide at the back. But it is usually that they are the shortest person in the group, and then you have this awkward floating head in the middle of a nicely formed row. My biggest tip to help not getting a stale forced smile is to say something half funny, do a nice fake laugh and then just hold that laugh for a fraction longer than you usually would. Laughing relaxes you and your face, so it looks a lot less staged and plus laughter is the best thing for your soul. 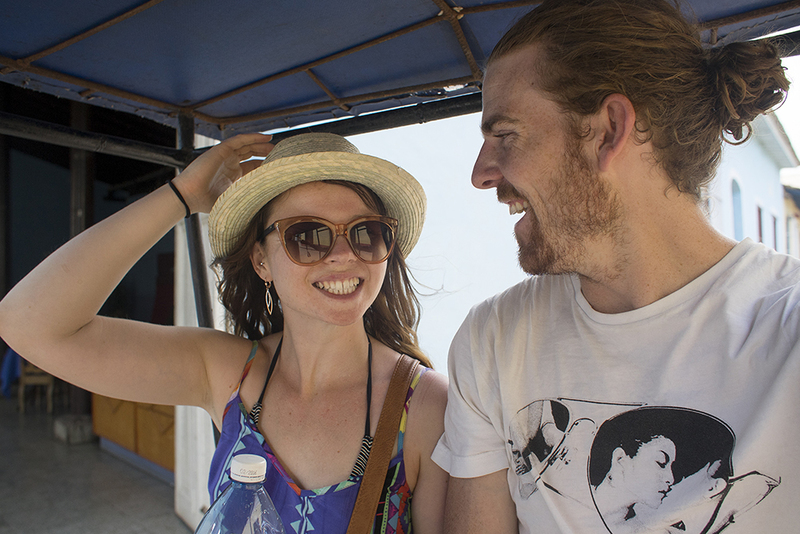 This is us bumping along a cobblestone street in Cuba last year. Everyone wants a nice photo of you and your besties when you hit the town. However, unless you live near either the North or the South Pole, it will be night time when you head out. Turn the flash off on the phone to take the photo, then grab another friend’s (or two) phone and turn the flashlight on and direct it to the people you want to photograph. Three things will happen. One, you won’t get that washed out look from when the flash typically goes. Two, you can move your light source up, down, right, left to light your subject. Three, you can guarantee the photo will be in focus, as it has enough light on the subject to focus correctly. Trello is a project management website which is completely free with a paid premium service. It helps you organise your tasks and manage the projects you are working on. The ability to upload media into “boards” and have multiple people comment and interact with them is a great feature. You can set to-do lists for yourself and your team members and track when they have been completed. I use it to organise my life, I have a to-do list, a to-read list, a healthy eating list, a creative ideas list, etc. Click here to read a great review about Trello. Recently I held my first exhibition called #kissingourwayaroundtheworld. It showcased the images I took while travelling with Ashbey around the globe. For all of you who are living in another part of the world or couldn’t make it on the night, I have popped all the images below for you to browse at your leisure. My personal favourite place that we traveled to was Cuba. The colours and culture was nothing like I had ever experienced before. Our experiences were so versatile from watching kids playing baseball in the streets to salsa dancing in people’s homes. The vibe and feel of the place is of happiness and simplicity as there is limited internet, mobile phones or other distractions. The images were printed on aluminum in either a Matt finish or a semi gloss finish. There are still a few available for purchase, please email me if you are interested. Inspired Money www.inspiredmoney.com.au for supplying the wine. Pirate Life Brewing www.piratelife.com.au for supplying the beer. This photograph was taken in Goreme, a small town in Cappadocia, a historical region of Turkey. Goreme is a magical place famous for its “fairy chimney” rock formations. The most spectacular way to view these fairy chimneys is from Sunset Point, where a short (but steep) walk up the hill will give you a stunning view overlooking the whole town. After a full day of hot air ballooning at sunrise, horse riding on two bush brumbies, a Turkish cooking lesson with a chef who spoke no English and having a traditional Turkish bath, we decided we needed to cram another thing into our hectic (but amazing) day. So Travis packed up his camera gear ready for a night of photographing from Sunset Point. When we reached the point we were amazed at how busy it was up there and the number of tourists all securing the best spot to watch the sunset. After calculating potential photograph spots, Travis set up for this photograph however he couldn’t make the distance in time sprinting from his camera to me. Onlookers stood in a daze watching this crazy man running his little heart out multiple times. Then finally this lovely French man offered to press the button for him and vuala, this beautiful silhouette photo was created just in time. Plitvice Lakes National Park is one of the oldest national parks in Southeast Europe and the largest national park in Croatia. It is made up of 16 lakes that cascade into one another, creating beautiful waterfalls. There are boardwalks that weave their way over and around the bodies of water. Plitvice caters for more than 1.1 million tourists annually. On our first day trekking through Plitvice, we had to fight the many tour groups around the lakes and move at a frustrating very slow, stop start pace. As we were fortunate enough to be staying at a hotel in the national park, we decided we would get an early start on the tour groups the following day. So the next day we set off at 5:00am, in the pitch black, with only a mobile phone for light to guide us through the park. After getting face full’s of spider webs every 50m and freaking out that a brown bear was coming to eat me with ever rustle in the bushes, finally the sun began to peak above the horizon. It was well worth it though to have the whole park completely to ourselves for 3 hours so Travis had the luxury to take however many photos, where ever he wanted without interference from anyone else. This Photograph was taken in Plitvice Lakes alongside one of the 16 lakes that make up the national park. This UNESCO World Heritage Site is definitely not one to be missed when travelling to Croatia. Taking this photo was one of my favourites as it reminded me of the romantic rowboat scene from the movie ‘The Notebook’ (minus the rain). We also had loads of fun leading up to this picture; from learning to row in sync to taking silly photos of each other pretending not to pose. 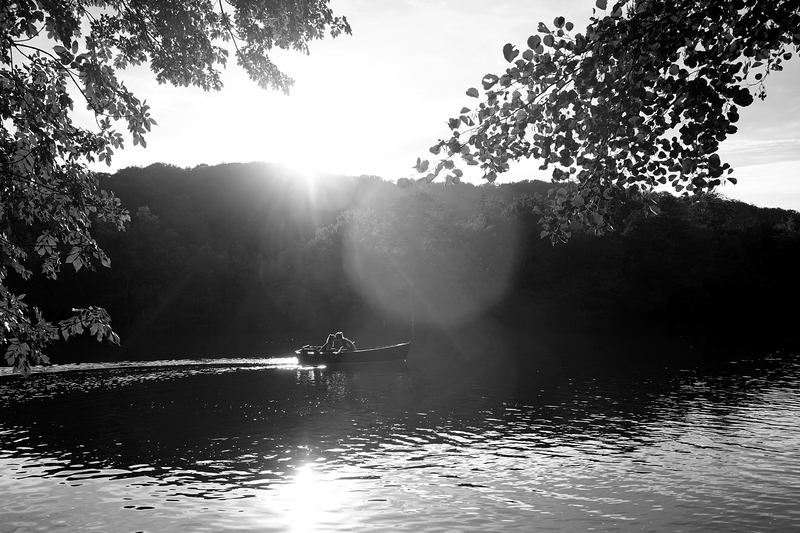 To capture this photo, Travis set his tripod up on the bank and jumped back in the rowboat. Much to his disappointment, we were too far away from his camera for his shutter release to work. So he called out to two hikers walking along the bank and asked if they could please press the camera button. The pressure was on as we had one opportunity to make this photo work. I think this is also part of the reason why we have a fondness for this picture, because of the circumstances it was taken under and somehow, magically, it turned out just as Travis had envisioned it. The Amalfi Coast is a 50 kilometre stretch of coastline along the southern edge of Italy’s Sorrentine Peninsula, in the Campania region. The sheer cliffs and rugged coastline dotted with small crystal clear beaches make it a popular holiday destination. Our favourite town along the Amalfi coastline was Positano, which is where this photograph was taken. 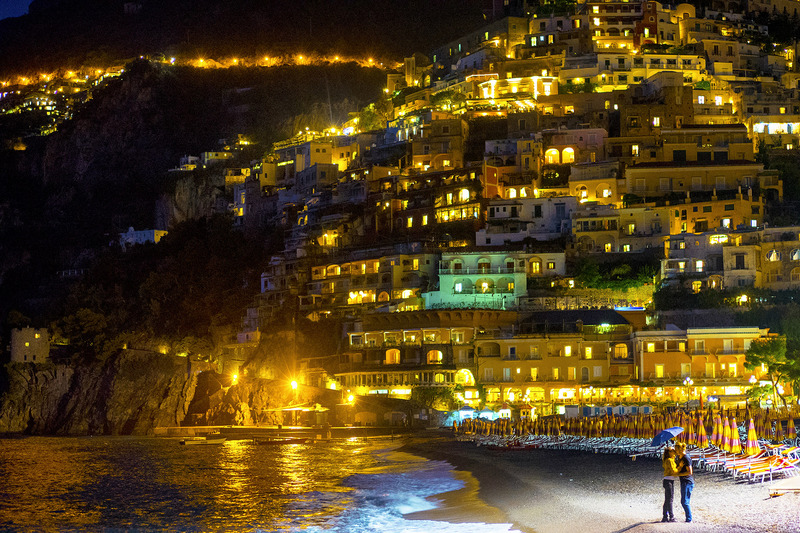 Positano is a vertical town where instead of roads, visitors explore by steep flights of steps. Trekking up and down hundreds of those steep steps is the one thing I will not miss! As we only had one night in Positano, we had to battle the sporadic bouts of rain to nail this picture. This was one of the longest distances Travis had to run from his tripod into the picture and it took multiple attempts until he finally pushed himself enough to make the distance. It didn’t help that he was battling a cold at the time but his efforts paid off. 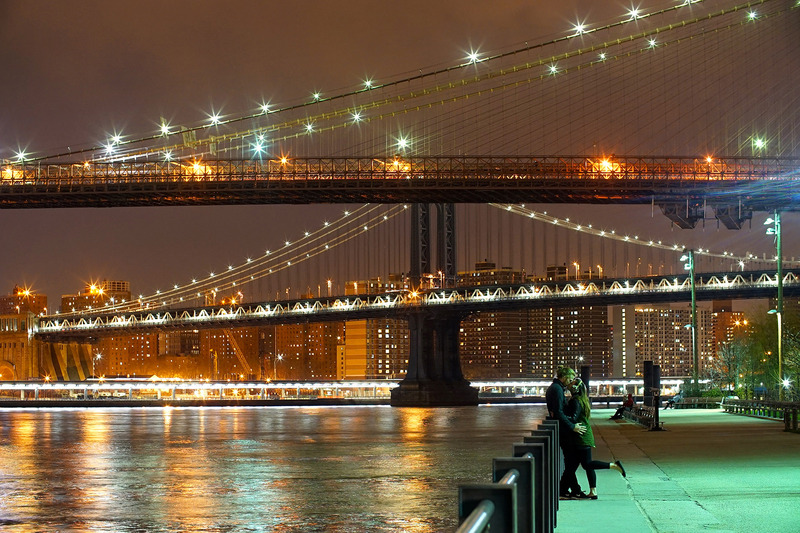 The Brooklyn Bridge is one of the oldest bridges in the United States. It is a hybrid of a suspension and cable-stay bridge. It was completed in 1883, took 14 years to build and cost $15 million which is more than $320 million in today’s dollar. More than 120 000 vehicles, 4 000 pedestrians and 3 100 cyclists cross the Brooklyn Bridge every day. The Manhattan Bridge is a suspension bridge which opened to traffic in 1909, eight years after construction started. Nearly 80 000 vehicles and more than 320 000 people use it (via public transportation) each day. 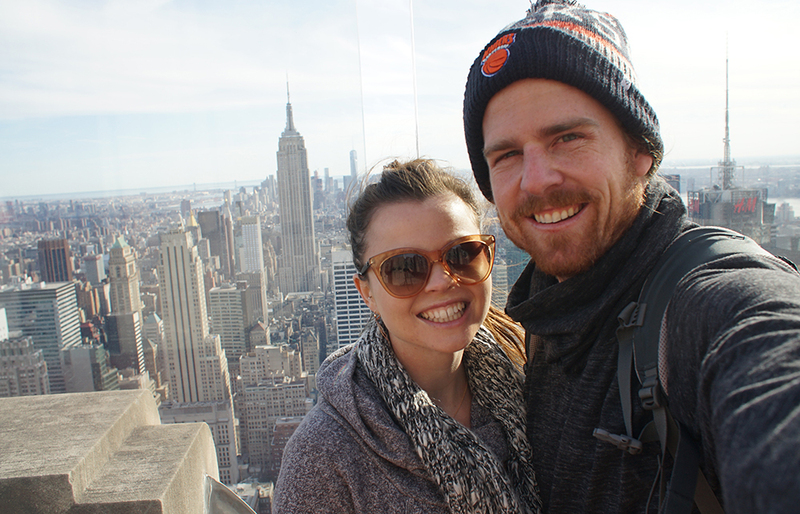 We walked across the Brooklyn Bridge to spend the day exploring Brooklyn. We found some really quirky shops, food trucks on street corners and a completely different hum to that of Manhattan. We spent hours walking around to try and find this one specific location that Travis had researched to photograph the bridges from. Alas, we could not find it, but he managed to come up with his own pretty awesome spots. This photograph was taken against the lower level of the Irish Hunger Memorial in Manhattan. The memorial represents a rural Irish landscape with an abandoned stone cottage, stone walls and potato fields. It is both a metaphor for the Great Irish Famine and a reminder that hunger today is often the result of lack of access to land. The memorial contains stones from each of Ireland’s 32 counties and is elevated on a limestone plinth. Along the base are lines of text separated by layers of limestone. The text, which combines the history of the Great Famine with contemporary reports on world hunger, is cast as shadows onto illuminated frosted glass panels. 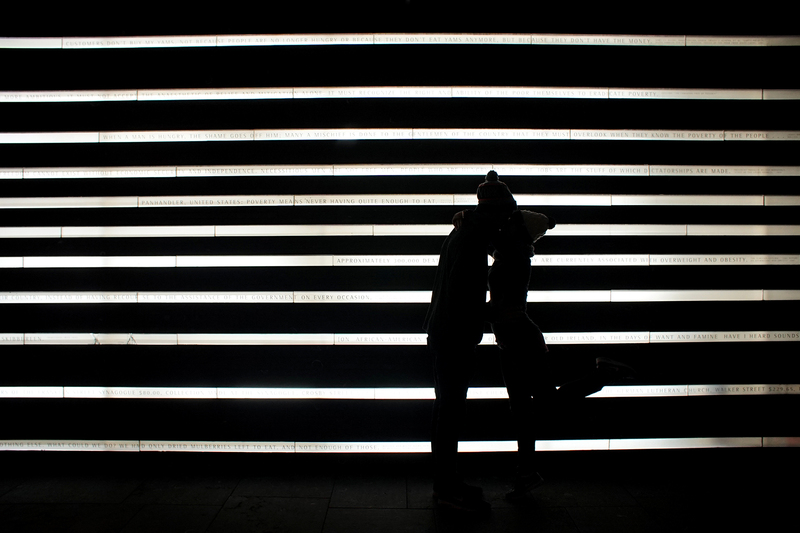 It is here you can see our silhouette against the illuminated wall. The possibilities were endless when it came to choosing a spot around the memorial to take a photo as every angle offered a new interpretation of the light. This photograph was taken late at night so we were battling with the bone chilling New York winds and after making sure we got a photo in front of every corner of the memorial, it was a nice relief when Travis called it a wrap! The Szechenyi Chain Bridge is a suspension bridge that spans the Danube River. It connects Buda and Pest, the western and eastern sides of Budapest, the capital of Hungary. The construction of this bridge began in 1839 and took 10 years to complete. At the end of World War II, all of Budapest’s bridges were blown up, including the Chain Bridge where only its pillars were left standing. The decision was made in 1949 to rebuild the Chain Bridge and its completion took 2 years. We had spent the day exploring Buda Hill and as we started to lose light, we decided to head back down the hill through the parklands. There was very little lighting up the narrow pathways and we had to be careful not to misstep as it was a steep descent. We suddenly felt like teenagers again as every corner we took there was a young couple pushed up against a tree in a fierce embrace. Besides being captivated by how many displays of public affection were going on around us, we were just as mesmerised by the spectacular views below us. The whole river bank had come to life with every building and bridge lit up. We stumbled upon a lookout point overlooking the Chain Bridge and decided it was time for us to join in on the affection fun and do what we do best; kissingourwayaroundtheworld. Glenorchy is a small settlement in the South Island’s region of Otago. It is a paradise for outdoor enthusiasts. Here we strolled along Lake Wakatipu, walked the main street where we found a quaint little cafe for lunch and finished the day with an outback horse ride. It was amazing to ride alongside forest areas where scenes from The Lord of the Rings were filmed. This photograph was taken on the jetty that jutted out over Lake Wakatipu. Unfortunately for us the weather conditions on this particular day were very harsh. We battled between rain and heavy fog which hid the scenic views. This made it hard to take a decent picture but somehow, posing for sheer seconds while the fog had parted, this beautiful moment was captured. Amsterdam is known for many things. One being that cycling is key to the city’s character and it has 400km of cycle paths. Another is its notorious nightlife. The Red Light District makes up a large part of this city’s appeal where prostitution is legal and it is estimated that 8 000 people work as prostitutes here. Each year, around 200 000 men visit a window prostitute in Amsterdam and this does not include clubs, home prostitution, escorts etc. Another draw card for this city is the water canals. Its canals and harbours fill a full quarter of its surface. With all this water come all these bridges. We enjoyed strolling alongside the canals and soaking up Amsterdam’s beauty. Every bridge we crossed Travis would be searching for a possible spot to take a photo, but it was proving more difficult than anticipated as he needed his camera to be centred in a boat on the canal. So he gave up on the idea. 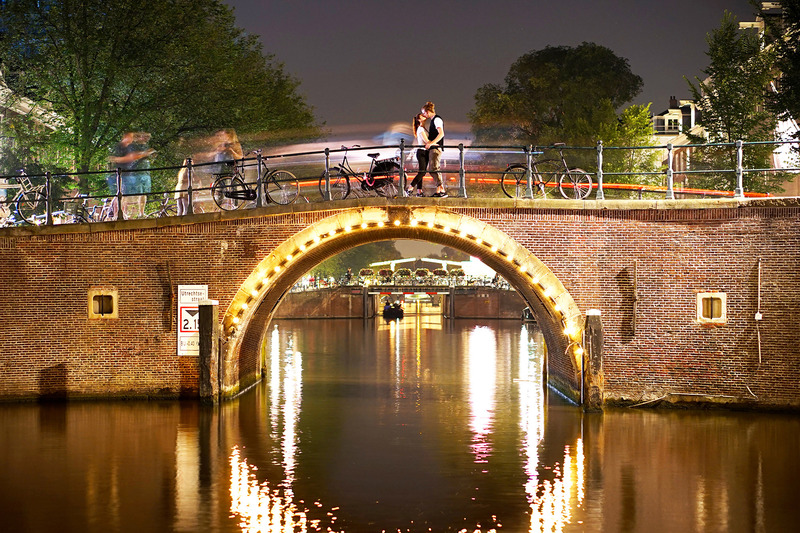 It wasn’t until our last night in Amsterdam that Travis made the ‘Canal Kiss’ happen. After a night out with two friends who were staying at the same hostel as us, Travis spotted an area alongside a canal that would work for a photo. He set his tripod up on the edge of the canal and as we posed on the bridge, our new friends clicked the camera. The exact location of this photograph is unknown. This is what we do know about it. 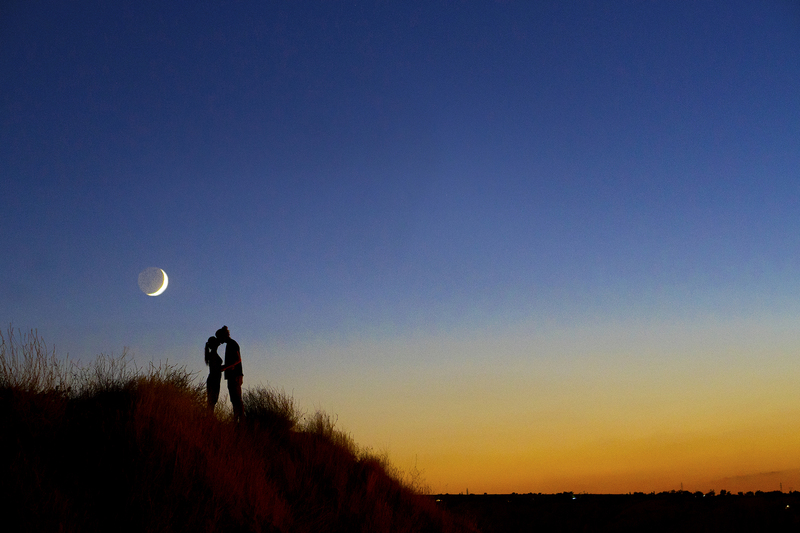 It was taken in the South Island of New Zealand. We were driving from Wanaka to Tekapo Springs. When driving around New Zealand, it is so easy to feel like you’re getting nowhere as you pull over so often to photograph a new piece of its spectacular landscape, whether it is the mountains, the winding roads, the hot springs, the snow, the luscious green fields or the Kauri tree plantations. So we were driving along and without warning Travis pulled our camper van over. I knew a photo moment was about to happen but I was a little perplexed as to what he wanted to photograph. The scenery around us didn’t look any better than what we already had photos of. But I would never have seen what it was that Travis saw because I don’t have the photographer’s eye that he does. What he saw wasn’t a beautiful view with mountains in the background, but a light spray that filled the sky with colour. And that is how this unique photo came about.